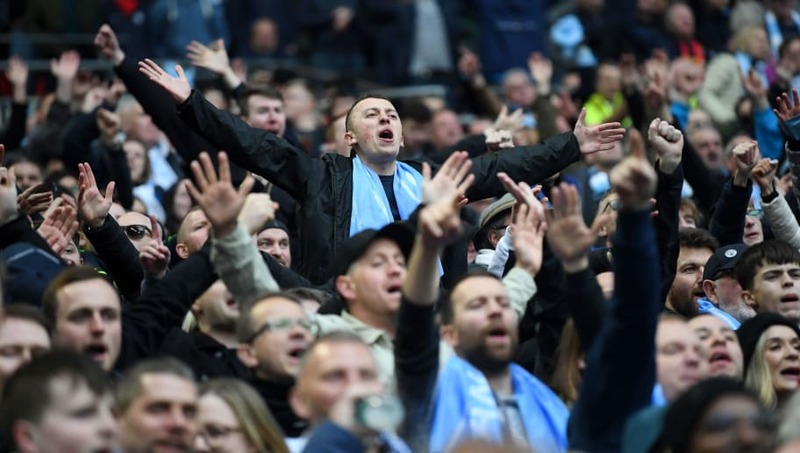 Manchester City fans have been heavily criticised in the wake of the FA Cup semi final after the club couldn't sell its full allocation of tickets for the game against Brighton at Wembley. It was reported in the days before the game that the club had returned as many as 2,000 unsold tickets that were provided in addition to the original 30,000 allocation, of which an estimated 25,000 had been sold by Wednesday, ahead of kickoff on Saturday. Fans of other teams have found it hilarious that one of the biggest sides in the world is unable to sell tickets and the weekend was just a continuation of the 'Emptyhad' jibes that have dogged City for the last few years. Strip away the context and it looks bad on City supporters. But view the situation for what it really is, the jokes are quickly shown to be ignorant to some of the real circumstances at play. There are several connected reasons why City failed to sell all of their tickets for the Brighton tie. At the outset, supporting a Premier League football team is an expensive past-time, and supporting a successful Premier League football team is even more expensive. For City, Saturday was already a third trip to Wembley of the season after playing in the Community Shield in August and the Carabao Cup final in February. Admission for Wembley games is not cheap - the returned tickets were said to be the more expensive at £120 each - nor is travel from Manchester to London, food, drink, programmes and everything else it entails. Missing out this time, means that some might be able to afford to go to the final instead. Less 'plastic', that is prioritising for those who cannot afford it all. Add to that the fact that City are also playing Tottenham in London in the Champions League quarter finals this week, at more significant expense. Given that midweek away trips will also require fans to take time off work to get there, some might not only be spending vast amounts of money, but not actually earning any that day to compensate either. Furthermore, City remain one of the favourites to win the Champions League this season, so an additional trip, this time abroad to either Turin or Amsterdam, lies ahead if the club gets the better of Spurs over two legs. Then there is the possibility of the final in Madrid to consider. Let's face it, if your club had a semi decent chance of reaching the Champions League but you only have a limited budget to spend, would you skip a domestic semi final if it meant you could afford to go the big one later in the season? It's basically a no-brainer. Generally speaking, people in the north of England don't have as much money as the south and City in particular have a reputation as a club with a local and largely working class fan base. To expect people to be able to follow in their thousands everywhere the team goes is unfair. Taking to Twitter in the wake of the Brighton game, prominent fan, City square host and Manchester radio presenter Natalie Paweleck, explained her reasons for not attending. Having revealed an initial hesitance to speak up over fear of being mocked, Natalie tweeted, "I chose to save the £200 I would have spent or the £400 my husband and I would have spent on our third Wembley trip this season. "Life isn't cheap. We both work bloody hard and spending that much money in one day is a luxury." She described being 'ashamed' of the media that has peddled the narrative, adding, "I will be at Wembley for the final, we will budget the money. It won't just grow on a tree! We will also find a babysitter for our 18 month old son and a dog sitter for our two dogs!! It just isn't as simple as some rich journalist or jealous 'fans' of other clubs make it." Thanks for all the replies of support. It seems so so many people have the same story as me. I totally appreciate people saying I don’t need to explain or defend myself. I do think it’s important people understand though and maybe think twice before mocking again. One of the reasons City might struggle to sell full ticket allocations is that their fan base, while incredibly loyal, as proven by huge attendances in lower leagues, is simply not as big as those at rival clubs like Manchester United, Liverpool and Arsenal. The demand for tickets is therefore not as great because there are fewer supporters and it means that when regular fans occasionally have to pass, there isn't the same volume of people waiting in the wings desperately hoping to pick up the extras. It is indicative of the sheer speed at which City have grown over a 10-year period. The most successful clubs usually have the most fans, but City's pool of support just hasn't had time to catch up. At some point, it almost certainly will do.